Demand for fresh cut culinary herbs is increasing in the southern piedmont region of NC. Initial trials show that French Tarragon can be grown in North Carolina as a commercial culinary herb crop. Use of fresh cut culinary herbs has been on the increase in the last few years. This trend will continue as people assume healthier eating habits and the number of restaurants that use fresh herbs increases. The use of fresh herbs as compared to dried or processed is continually growing, especially among formally trained chefs. With the recent opening of a major culinary arts university in Charlotte and the growth in the culinary arts programs at the community colleges, demand for fresh herbs is sure to grow. French Tarragon was chosen as it is not normally grown commercially in this region. 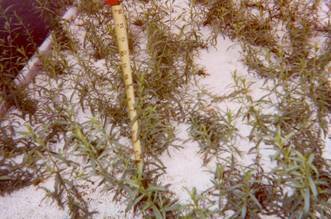 French Tarragon does not produce viable seed so it must be propagated by division in the spring or fall. Growers should beware as there are a number of varieties that are not suitable for culinary use. Two methods were used for this trial; 1 – Hydroponic using perlite as the growing medium with a continuous flow standard 1200ppm nutrient solution at a pH of 6.3. The crop was grown on 4’x10’ raised tables with 5” plant and row spacing. 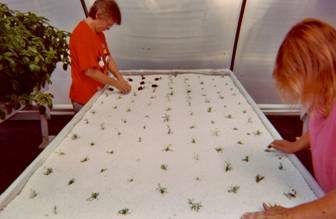 2 – This method involved the potting of the plants in a peat lite mix composed of 55% Canadian Sphagnum Peat, perlite, and vermiculite. These plants were place on a 30 day fertilization plan using and all purpose 15-30-15 fertilizer and water as required to maintain the potting mix moist. The rate of growth was 1/3 faster for the hydroponic method as opposed to the potted plants with the former reaching harvest size in five weeks compared to seven weeks for the latter. The initial harvest from the hydroponic crop yielded 5lbs, per table or 1lb.per 8 square feet of growing space, with a 3 week recovery period to the second harvest. As the plants propagate from the roots, the plant density increases and the per harvest amounts increase i.e. after six months the per harvest amount was 8lbs. per table. The initial harvest for the potted plants yielded 1lb. per 55 plants, with a recovery period of five weeks to next harvest. As these plants propagated the yields increased to 1lb. per 40 plants. French Tarragon can be grown successfully in this region of NC. If grown in a conventional outdoor setting, beds are recommended to maximize plant density and space utilization.